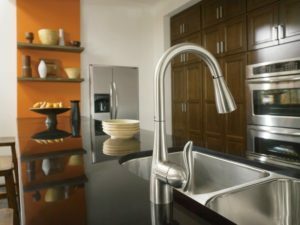 Where to buy best kitchen faucets in 2018? What is the basic part of the house which tells about the nature of the owners, Kitchen? I believe that most of you will agree to my stance because kitchen is the most important and crucial part of building a home as it is directly linked with the living habits of the people living in the house, in order to make your house a home it is important to make your kitchen presentable and well managed. When it comes to making the kitchen managed and clean, the first thing which pops up in the mind is the kitchen faucet. The best and touchless kitchen faucet is the very first thing which contributes towards a clean kitchen and it doesn’t matter whether a kitchen is small or large, faucets are present in every kitchen as it is the basic part which gives kitchen, its looks. In order to make your kitchen more remarkable and easy to the eye, it is important to have faucets which attract the eyes and gives a light look to your kitchen. If a person enters the kitchen, the first thing they will look at is the faucet. The kitchen faucet decides how the kitchen will look like and which thing will go there if you have a knack for interior designing. I hope you will get my point at an instance and if you do not have a knack for it, don’t worry in this article I will explain what to look for when you are buying a kitchen faucet and what are the different platforms from where you should buy kitchen faucets. In order to buy a kitchen faucet, you need to make sure that what kind of faucet your kitchen supports. You can check the compatibility by looking for holes available in the kitchen sink. This technique is for those who are installing a new kitchen faucet. If you had a faucet previously and It had a mounting plate on it, check for the number of holes under the sink covered by the mounting plate. There are different versions of faucets and all the information about the opening of the faucets is written on the packaging. Kitchen faucets are classified on the basis of their holes and are numbered as 1,2,3 and 4. If you buy a faucet of number 3 and you have a sink with two holes, you need to figure out that what do you want to do with an extra opening. 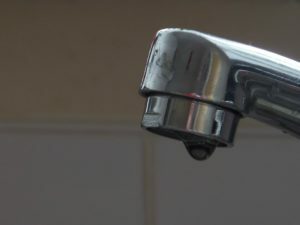 Also, take a look at your water pipelines as it is very necessary to check the size of water pipes and make sure that your kitchen faucet is compatible with your water pipeline. The faucet should match the finish of the sink and all the other accessories which form the sink. This is very important information as it will help you in understanding the layout of the kitchen and how to attach your faucet to the sink in a perfect manner which looks comfortable to the eye and fits according to the other accessories. Now I am going to talk about some of the famous types of faucets which are commonly used in households. Single-Hole Faucet: This is called single-hole faucet because it only comprises of one hole and also you need only one hole to install this faucet and the simplicity of the faucet is also reflected with the design which is also very simple. Centerset: Centersets are used very widely. It is installed with the help of two holes and it also requires two holes in the faucets, it has separate taps for hot and cold water. Widespread: Widespread faucet is very similar to those of center set and there is only one difference. Widespread use separate and individual parts instead of attaching all the parts to the same base plate. Pull-out: These are very versatile faucets as these can be detached from the base and can be used to rinse the sink, wash dishes and apply water with pressure. The basic advantage of this faucet is the mobility that comes with it. Side-sprays: Many people have aesthetic concerns on the shape and idea of pull out faucets and for those people there is side-sprays, it is used in a traditional tap way and it has a separate part which can be used as a pull out thus giving the functionality of both faucets and satisfying a large customer base. These were some of the styles of faucets you can buy from the market. Now I am going to tell you about the sources from where you can buy these modern kitchen faucets. Number one of the list is Alibaba express. Alibaba express is an online store and it has a wide variety of faucets the basic reason for that is that this company is based in China. A large number of kitchen faucets are supplied from this platform to all over the world every month because the designs and structure of faucets that this platform has to offer are not found on any other platform. Next is Amazon, which is also an online store mostly people living in the United States of America buy faucets from this platform. Faucets provided on this platform are very elegant and beautiful but they have a high price range as compared to Alibaba express and that is why they receive fewer orders from different countries for the supply of faucets. These two platforms are the best there are in order to provide kitchen faucets to the people, if you are in for expensive and luxurious faucets, you should go for Amazon but if you consider price an important factor you should consider Alibaba as their design is unique and have a large set of kitchen faucets which come with more and more innovation. Kitchen faucets complete the look of the kitchen and it is very crucial to select the right faucet in order to save oneself from the irritating task of changing the faucet again and again. Hence, it is necessary to read the instructions and information given on the faucet carefully.